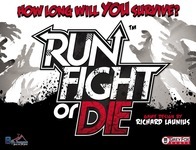 Game Tips for Run, Fight or Die! On the other way, we found little interaction between the players than we would have liked. So we house ruled that any time a Zombie moves back from Zone 3 (from the ‘run’ result on the die or any other event) instead of removing to stock you place that Zombie on another player’s Zone 3. This add up a little more interaction between players and empowers a little the ‘run’ icon. By the rules, zombies that attack you are removed from the board. Don’t remove them and you’ve got a slight increase in difficulty without really changing the complexion of the game.